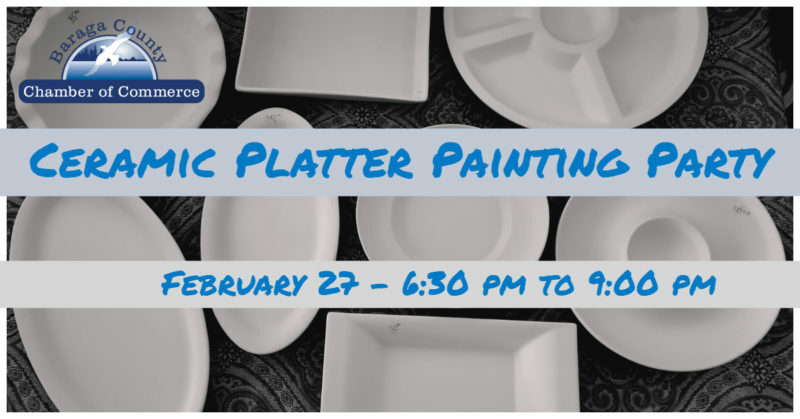 Come paint a platter with Brenda Hoffman at the L'Anse American Legion. Participants can choose from different size/shaped platters and apply ceramic under-glaze. Platters will then be over-glazed and fired in a kiln. Platters will be available for pick up the following week. Light snacks and punch will be provided, but adult beverages and pop will be available at the bar. This event will also include some door prizes. $5 of the cost will benefit the American Legion's deck fund and $5 of the cost will go to the Baraga County Chamber of Commerce to help fund future events. Cost will be between $30 - $45 depending on the size of platter you choose. Must register by Friday Feb 22nd.